In June Brits on Pole was invited to attend Friday practice at the British Grand Prix as guests of Ferrari and Shell. 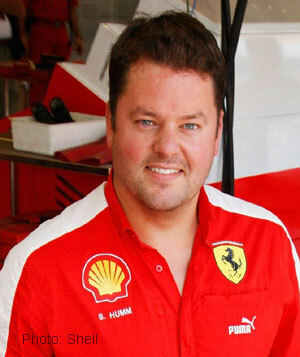 One of the people we met was Stuart Humm, who is based at Shell Brands International’s headquarters in Switzerland and has responsibility for overseeing the commercial aspects of Shell’s technical partnership with Ferrari. We didn’t have as much time on the day as we would have liked to chat in-depth to Stuart about the bigger picture in F1, including issues such as branding, sponsorship and driver management. But he very kindly agreed to answer some follow-up questions for us – and here are the results. We think he’s given a great insight into an area of the sport that isn’t always accessible to fans and we’re grateful to him for taking the time to answer our questions in such depth. We hope you enjoy the conversation as much as we did. As someone who previously managed Intel’s sponsorship of BMW Sauber in Formula One, could you tell us about some of the branding challenges and some of the advantages F1 has? How is it doing in relation to other sports, particularly football? Formula One is the biggest annual sporting championship in the world with, according to the FIA, over 600 million viewers per season. For many brands it represents partnership opportunities that can meet a variety of commercial objectives, but the majority of sponsorships are entered into on the back of clear strategic planning and backed by significant research and insight about consumer choice, preference and interest. For example if your brand or product has a direct link to motoring or technology or innovation (as Shell does) then Formula One is a clear fit. Other brands or products may lend themselves better to different sponsorships such as football, depending on what the brand stands for, what the product is/does, how the consumer relates to it, who buys the product, and so on. In your opinion, which is winning out, the challenges or the advantages? Is it becoming easier or harder to sell the F1 brand to a sponsor? Is the sport holding its own in the current very testing economic climate? Formula One has always been seen as one of the pinnacles of sports marketing. Historically it has always been well-placed to offer brand exposure and a package of relevant opportunities to promote their businesses. The challenge for Formula One is that many of its competitor sponsorship properties were often two steps behind in their ability to offer comparable sponsorship platforms in terms of quality and reach. This has changed and there are now a number of alternative routes for brands offering comparable packages often at a lower ticket price. However the Formula One brand is as strong as ever and whilst in some areas it will need to reinvent itself and evolve, in others it remains a step or two ahead of the game. Whilst there is an onus on the sport of Formula One to meet this challenge, ultimately it is down to the sponsor to make the right choice. Formula One is not the right property for every brand. We met because Shell saw value in promoting itself via bloggers, and other motorsport-related brands such as Vodafone are also experimenting with viral video and social media. But these methods of promotion are, by their nature, impossible for a brand to have total control over. How do you assess the challenges and opportunities to a big brand from the democratisation of information on the web? There are always opportunities and challenges in anything in life! At Shell we want to engage with people who are interested and enthusiastic about motorsport, and talking to the online community, through our websites, bloggers, and other channels is a great way of doing this. Shell doesn’t only work with Formula One but also with the European and American Le Mans series and also some top motorbike series. Can you briefly outline Shell’s strategy in motorsport? Shell currently has a portfolio of motorsport partnerships, which provide the ultimate technical platform to test and develop our Shell V-Power fuels and Shell Helix Ultra lubricant products. We work side by side with Ferrari in Formula One, Ducati in Moto GP and World Super Bikes and Audi in Le Mans. If we take Shell V-Power and our technical partnership with Ferrari as an example – this relationship provides Shell with the perfect environment to test new fuels and technologies in the most extreme conditions. We then gain a much better understanding of what will deliver performance both for Ferrari on the track, and also for our Shell V-Power customers on the road. Our technical partnership has powered Ferrari to 10 Formula One World Constructors’ and 12 World Drivers’ titles. This success and these learnings are the culmination of over 60 years of shared passion for performance with Ferrari in the motorsports arena. This translates to all of our partnerships – Shell takes the information that we learn at the race track in our dedicated facilities such as the Shell Track Lab, and through our technical experts and scientists who attend every race, to test and prove our products in the ultimate environment. This way, we apply the technologies for the highest performing and most efficient fuel and lubricant products for our customers at each of our retail sites. Can you tell us how a team works to establish its own brand or identity? Clearly Ferrari has a rock-solid brand and others like McLaren, Williams and Force India all have strong, identifiable characteristics. Other teams such as Toyota or BMW Sauber don’t seem to us to have such a clear brand, separate from the manufacturer that backs them. What’s the secret? I cannot comment on the position of any of the Formula One teams, but as purely as a fan of the sport, I think Ferrari, McLaren and Williams, in a racing context, all have rich racing histories as manufacturers. Over time I am sure that coupled with on track success other teams will further establish their identities within Formula One. When matching brands with sponsors, how much thought goes into visual fit? Clearly the red and yellow Shell logo matches the red Ferrari car beautifully, but other partnerships are less successful! And fans can get very vocal about the appearance of their favourite cars. Does this matter beyond the grandstand? Brand fit is a key ingredient for both parties in any partnership. I believe that Shell benefits immensely from its close technical partnership with the brand values of Ferrari and vice versa. There are many brand attributes that Ferrari has that Shell clearly identifies with and Ferrari clearly see the same brand value exchange in the opposite direction. Getting the wrong fit can be damaging in many ways. When a group of consumers are passionate about sport, you have to treat your associations with the respect and courtesy that the fans expect of you. If you don’t do this then sporting fans will quickly turn away from your brand. In American racing often the team is secondary to the commercial sponsor to the extent that Danica Patrick talks about winning in her Boost Mobile/Motorola No 7 car rather than her Andretti Green car. If, for example, a global brand like Virgin started working with a relatively unknown team like Manor, we could see this becoming a feature of F1. What do you think? To a certain extent major, long-term sponsors already have a similar benefit in Formula One. Currently, some teams are named alongside their major partners such as or Vodafone McLaren Mercedes, or AT&T Williams. However, it is all about balance. In Formula One the teams themselves are brands within their own rights who are a major part of the sport. As such you do not want to over-commercialise the sport whilst protecting the value that can be given to sponsors. For most brands, pure exposure should never be the sole objective of a Formula One partnership. If that is all a company requires from a relationship there are often more effective ways to invest your money so a healthy balance is what is required. How do you rate the whole issue of green technology and especially green fuels when it comes to F1 branding? Given the tangle that the IRL has got into over American and Brazilian Ethanol, it seems to us that how the sport handles this could make or break its future. I cannot comment on the role that this technology will play in the future of the sport. However, Shell continuously works with Scuderia Ferrari and FOFAF (F1 Fuels Advisory Panel) on the future development, testing and introduction of new fuels and lubricants into Formula One. As I mentioned before, Shell takes the information that we learn at the race track to test and prove our products in the ultimate environment, applying the technologies to products for our customers at each of our retail sites. You’ve worked in driver management – it seems to us that a driver’s career hinges on his or her ability to fulfil commercial requirements, attracting the money necessary to run cars and form partnerships with teams. What advice would you give to aspiring drivers, or those just starting out, who have the talent to make it but not necessarily the commercial experience? I can only offer advice from a management perspective as I am certainly not an expert in the demands of driving a Formula One car. I think that drivers at all levels need to realise that their jobs will inevitably stretch beyond simply driving the car. Without companies investing in their sport and their careers they won’t have the opportunity to drive, so working with sponsors and fulfilling personal and team contractual arrangements will be part of the job description. Like in any sport those drivers who have the whole package are the ones that teams are more likely to want to work with. Inevitably if a driver is able to build strong relationships and work hard for his or her sponsors then the sponsor is more likely to continue spending money with their career the following year. Try to enjoy working with sponsors and where possible show an interest and learn as much as you can about their brand and their business. If you can hold a conversation with a sponsor about their business and the industry that they work in and when working on their behalf relate some sort of reference to the brand or business that they are promoting you just might find that sponsor wants to invest more in you and your career in the future. What race series outside F1 do you believe currently has the best commercial potential? NASCAR is incredibly popular in the US and does many things, which I believe F1 could look to for inspiration and commercial best practices. Shell has recognised the technical value of NASCAR for many years with our involvement in the Richard Childress Racing Team. NASCAR has a different approach to Formula One, but you see the numbers of fans and sponsors engaged in the sport and it is clear that they are doing something right. I think the most memorable moment was Brazil last year as it was such a dramatic finish to a season between two world-class drivers in Lewis Hamilton and Felipe Massa. Neither deserved to be the runner up but in sport there is only one winner. When you witness how Felipe returned to the garage and handled the situation so magnanimously it was an inspiration for all around him. Stuart Humm graduated with a degree in marketing from Lancaster University in 2000 and worked at Reebok for four years with football teams including his own club, Liverpool  an opportunity he describes as one of the most extraordinarly moments of his career to date. He worked in driver management for Eden Rock Sports and as a sponsorship manager for Intel and BMW Sauber at Momentum PR in London before joining Shell in 2008. Categorised under F1, Opinion, tagged under branding, driver management, Ferrari, Formula One, Shell Motorsport, sponsorship, Stuart Humm.